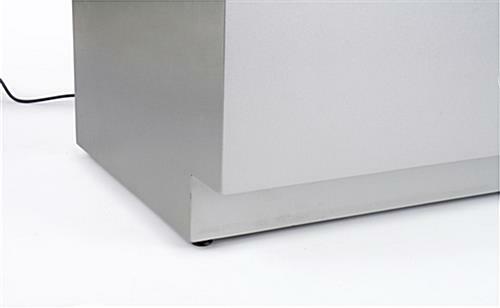 MDF construction with silver semi-gloss finish for sturdy and sophisticated look. Stands 42", 4: taller than traditional counters. 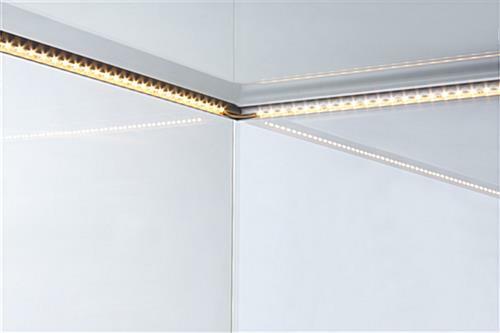 Energy efficient LED lights cast a natural light for an attractive appearance. 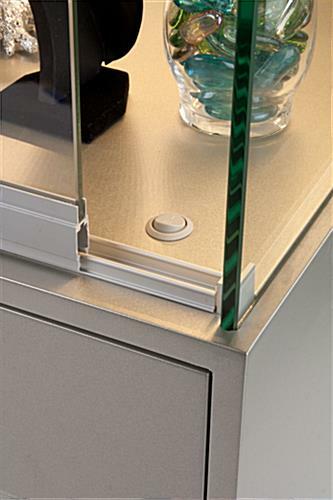 (2) Rear security drawers and locking cabinets provide ample space & secure storage. Coordinates with other Grace Tyler cases for unique configurations. Floor levelers ensure stability on slightly uneven floor surfaces. 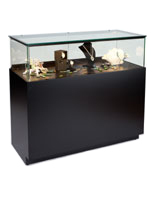 Each quarter vision jewelry display counter with LED illumination is crafted of sturdy MDF with a silver semi-gloss finish for a sophisticated look. 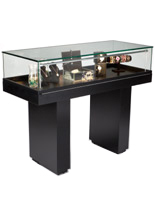 The top merchandising case is constructed of tempered glass which is less likely to break or shatter than traditional glass. 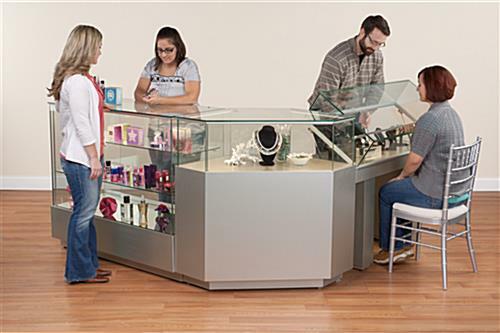 Retailers can access this top showcase by two sliding glass doors that lock, keeping merchandise safe and secure. 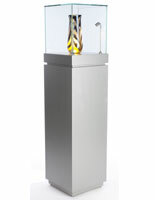 Each glass jewelry display counter with LED lights accentuates any upscale retail store. Merchants use these cases as LED lighting casts a natural light on products making them look their best! 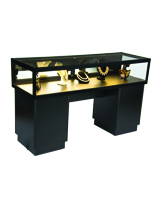 Each jewelry display counter with LED lights is also more energy efficient than traditional halogen lighting. With ample merchandising space, this showcase displays necklaces, rings, earrings, and other merchandise! 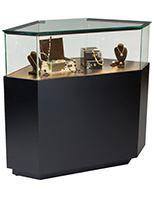 This retail jewelry display counter with LED lights, called a merchandise showcase, has a height of 42", 4" taller than traditional cases. The additional height allows customers to peruse merchandise without having to bend over. This Grace Tyler showcase, LED-lit jewelry display counter can be coupled with other store cases to create almost any configuration! 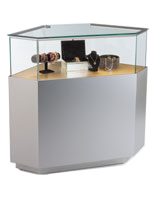 Use this showcase and others from the Grace Tyler series to customize a unique configuration suited for any retail shop! 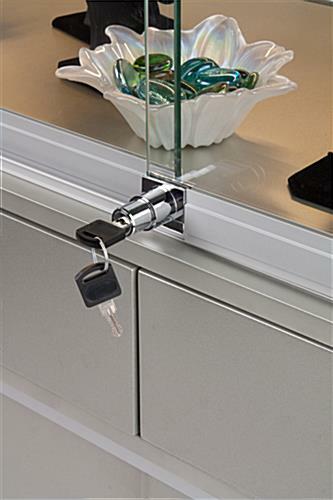 Each quarter vision glass jewelry display counter with LED-lights and a silver semi-gloss finish features (2) rear security drawers with locks as well as locking cabinets with sliding doors. Merchants use this space to store inventory or gift packaging as this storage area can be conveniently accessed in the back of each showcase. 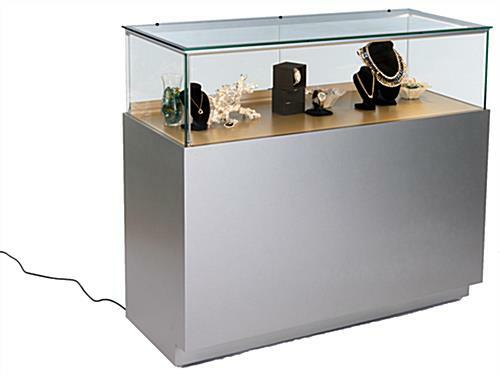 An LED-lit jewelry display counter with an attractive silver semi-gloss base also features floor levelers. 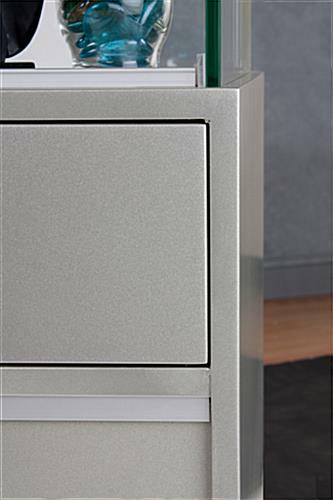 The adjustable feet ensures the case will remain stable, even on slightly uneven surfaces. 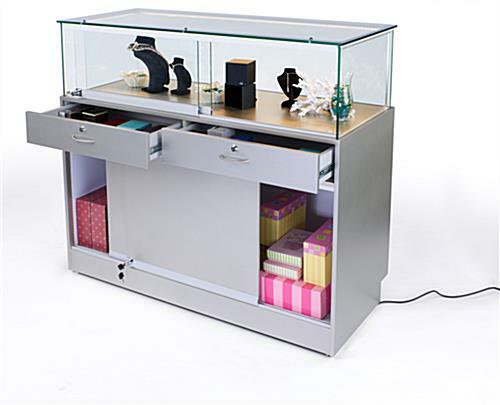 This retail jewelry display counter with LED-lights also features a recessed toe kick, so any accidental scuffs due to foot traffic will remain hidden from view! 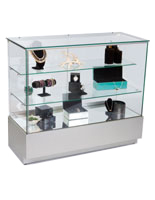 This showcase ships fully assembled for immediate use and is ideal for fine retail stores!